If anyone would like to have copy with higher resolution, we can send it by e-mail. Transcripts of some of them are included on these two pages. Pots for people at a reasonable price appears to be a simple guiding principle for a potter, yet it points to a world of commitment on the part of David Schlapobersky and Felicity Potter. Their statement of belief embraces an approach to life that is derived from the English Craft tradition, one that implies that work and life are indivisible. The production of tableware takes place in a domestic environment and on a domestic scale: the home-studio defines the parameters within which the two potters function. It limits the scale of production and prevents its growth into anything approaching industrialization. It also ensures a dedication to each piece on the part of the two artist craftsmen: enshrined in the notion of pots for people is a sense that a personal commitment is conveyed in each handmade article, so that each pot is by implication a conduit of communication from craftsman to owner. This notion of the honest labour of the artist-craftsman can be traced to the pastoral ideologies of Leach and Cardew. This approach stresses the importance of utility, and in Schlapobersky and Potter’s work usefulness is a major consideration. Functionalism is implicit in the principle of ‘pots for people’: cups and saucers and dinner services are made with utility in mind, and the work of Schlapobersky and Potter meets practical requirements in the fit of cup to saucer, the balance of handle to volume and the smooth surface of the glaze. Decorative motifs painted by Potter lend visual appeal to the tableware. In addition, large free-standing vessels are made by Schlapobersky and decorated by Potter. Tim Morris was initially very influential in the development of Schlapobersky and Potter’s ceramics. The notion of making their pots with people in mind and their desire to give enjoyment were derived from Morris’s thinking. His encouragement was instrumental in their setting up a production studio at Cresset House, a home to the mentally handicapped in Johannesburg, in 1972. We are the sum of our experience and all who have preceded us, and no one epitomises this better than David Schlapobersky and Felicity Potter, the quintessential professional studio potters. I met David and Felicity for the first time recently and was struck by their fierce devotion to their craft and their down-to-earth integrity and commitment to a life-style they admit is founded on adversity and hard work but filled with rewards. Together in seemingly perfect equilibrium, they create magic with fire, clay and glaze, producing a dazzling array of wares, ranging from utilitarian dinnerware and beautiful tactile planters to large decorative urns. David is responsible for all the throwing and I was amazed at the grace of his larger forms which comprise of as much as 100 kg of clay, robust yet elegant. Felicity, who studied textile design and art, applies the many free flowing design, her brush strokes fluid, confident and unrestrained, perhaps a reflection of her gentle inner strength and serenity. David and Felicity’s primary focus is high fired reduced ware, and they are among the few full-time professional potters who can boast such a high volume and quality output in South Africa today. I was surprised to see the wide spectrum of rich, glowing colours and designs on their work, having always associated high fired reduce ware with iron rich brown glazes on delicate grey or churn glazed wares. At the end of September David, Felicity, her son James and her mother, Ruth Wolff, move to a new home in Swellendam and a new chapter in their adventure. The look forward to a better quality of life and working conditions in a more secure, softer environment, in their new spacious barn studio complete with hearth for warm winter fires. They both express a sense of insecurity and loss having dismantled their kiln and packed their possessions in preparation for the move, and although excited both feel a little detached from their security base and for the first time in 23 years no pots are emerging from the studio. David’s plans for the future include the holding of hands-on workshops on various aspects of highfired pottery. He stressed the need for potters to explore and learn and to connect with each other sharing knowledge and ideas. I was inspired by them and impressed by their humility in spite of their success. We all wish David and Felicity success and happiness in this new phase of their lives. Anyone interested in stopping off at their new studio in Swellendam is welcome. David and Felicity are not only life partners, two highly principled people with an unquestionable integrity, a great love, compassion and empathy for all people, they are also partners in producing wonderful pots, pots made within the strict discipline of reduced, high fired stoneware and porcelain. All the throwing is done by David and the superb decorations by Felicity who studied Art and Textile Design at the Technikon. Cups and saucers, jugs – large and small, large platters, casseroles, planters, vases, all finely crafted, have attained an honesty and finesse through a process of evolution – a cycle of progress gained from discussing shapes and decoration together, working ideas through on paper and being ever mindful of the needs of their customers. For David and Felicity making pots that enhance the everyday lives of their owners is of prime importance, especially as they are truly professional potters whose livelihood depends on sales. Adversity introduced the couple to pottery. Felicity’s son, James, was hit by a car in Jan Smuts Avenue, an accident which left him severely handicapped and in 1972 David and Felicity moved with James and his brothers to Cressett House, a home for the handicapped, as house parents, as it was a matter of prime importance to them that James received the love and support of his family. It was felt that many of the residents of the home would benefit from doing pottery and David enrolled for classes in an effort to start the facility. His first teacher was Gordon Wales, a founder member of A.P.S.A. (Association of Potters of Southern Africa), who later emigrated to Canada. German measles proved to be a turning point in the lives of David and Felicity. James’ two brothers contracted this childhood illness and as there were a few pregnant members of staff the family were asked to move out of the home until they were germ free. Taking the opportunity of being free from the responsibility of the home, Felicity made contact with Tim Morris whom she met some years earlier and was impressed by his work and a visit was arranged. They discussed with Tim their plans to start a studio in Cresset House and with the enthusiasm and generosity for which Tim was known, he embarked on organising a major art exhibition, with contributions from leading artists, to equip a studio. Tim also shared his knowledge with them and in David’s words, “Tim lit a fire beneath them, a fire that still burns.” One of the important lessons he taught them was the value of repetitive throwing – a discipline so necessary to refine a potters skill and this is a discipline that they still practice today and is reflected in their cups and saucers. Porcelain cups and saucers that have evolved into enormously sound shapes. Thin rims for a pleasing drink, handles that are well balanced, they sit well on the saucer that is also easily lifted. Cobalt decoration over a white feldspathic glaze or an iron pigment over a warm celadon glaze before firing. By 1976 having established the studio at Cresset House whilst overseeing the farm and bakery and being house parents to 12 children exhaustion forced them to reconsider their lives and wanting to fulfil their commitment to provide a family life for James, they made a major decision to move into their own home and start their own studio. It was important that this venture succeeded as it would be their only income. After a short period in a rented house they acquired their present home studio in Parkview. Another influence that has been important in the development of their work is that of Ruth Wolff, Felicity’s mother, a well known interior designer. The large planters and vases, which enhance many homes reveal this input. The harmony of shape achieved by masterful throwing and superb decoration are evident in these pieces, a harmony that can only be achieved by the close collaboration of these two artists. Encouraged, once again by Tim Morris following the success of the Crocodile Ramble, David and Felicity were, with other Johannesburg artists instrumental in starting the Johannesburg Studio Route. By opening their studio to the public, David and Felicity feel that they can give back to the community by allowing them to see the potter at work and thereby educating them in the process of making pots. They especially enjoy the contact of other potters visiting their studio and are always willing to present workshops in which they generously share their extensive knowledge of pot making. The generosity of spirit that burns within them has also led them to be involved in the Alexandra Art Center. This center was started by the community of the township to encourage the development of their artistic talents. David throws all the pots in either stoneware or porcelain which is made at the studio. For his large planters up to five coils are added and pulled up in sections until the planters are approximately 80cm high. Platters, casseroles, lidded jars, large free standing vases are by some of their stoneware repertoire. Tea sets, dinnerware and small lidded boxed are usually thrown in porcelain. After the bisque firing the pots are glazed with a basic feldspathic glaze, a celadon or a cobalt glaze. Felicity then applies her sensitive brush decoration using either a cobalt or iron and Rutile slip over the dry, unfired glaze. The work is fired in a reduction atmosphere to cone 12 (1320 degrees centigrade) in a 90 cubic foot gas kiln. “Pottery is at once the simplest and most difficult of arts. It is the simplest because it is the most elemental; it is the most difficult because it is the most abstract. Historically it is among the first of the arts. The earliest vessels were shaped by hand from crude clay dug out of the earth, and such vessels were dried in the sun and the wind. Even at that stage, before man could write, before he had a literature or even a religion, he had this art, and the vessels then made can still move us by their expressive form. When fire was discovered, and man learned to make his pots hard and durable; and when the wheel was invented, and the potter could add rhythm and uprising movement to his concepts of form, then all the essentials of this most abstract art were present. The art evolved from its humble origins until, in the fifth century before Christ, it became the representative art of the most sensitive and intellectual race that the world has ever known. A Greek vase is the type of all classical harmony. Then eastward another great civilisation made pottery its best-loved and most typical art, and even carried the art to rarer refinements than the Greeks had attained. A Greek vase is static harmony, but the Chinese vase, when once it has freed itself from the imposed influences of other cultures and other techniques, achieves dynamic harmony; it is not only a relation of numbers, but also a living movement. Not a crystal but a flower. The perfect types of pottery, represented in the art of Greece and China, have their approximations in other lands: in Peru and Mexico, in mediaeval England and Spain, in Italy of the Renaissance, in the eighteenth-century Germany – in fact the art is so fundamental, so bound up with the elementary needs of civilisation, that a national ethos must find its expression in this medium. Judge the art of a country, judge the fineness of its sensibility, by its pottery; it is a sure touchstone. Pottery is pure art; it is art freed from any imitative intention. Sculpture, to which it is most nearly related, had from the first an imitative intention, and is perhaps to that extent less free for the expression of the will to form than pottery; pottery is plastic art in its most abstract essence. We must not be afraid of this word ‘abstract’. All art is primarily abstract. For what is aesthetic experience, deprived of its incidental trappings and associations, but a response of the body and mind of man to invented or isolated harmonies? Art is an escape from chaos. It is movement ordained in numbers; it is mass confined in measure; it is the indetermination of matter seeking the rhythm of life”. David Schlapobersky, Felicity Potter and the Bukkenburg Pottery. David and Felicity have been making beautiful high-fired pots for more than 30 years. In 1996 they decided to move from their lovely home and successful studio in Johannesburg and relocate to Swellendam in the Southern Cape. Recently I have been communicating with them via email and asked them some questions about the move, recent experiences, their work, aspirations and some technical details. David and Felicity: “Our life together over the past 32 years has embraced the notion that life and work are indivisible. In connecting that to the concept that art is life and the way you live it, then change and development is not only necessary but also inevitable. Imagination, timing and resources became some of the critical components towards making a decision about moving and taking action. We had been looking for many years at the possibility of moving to the country and had spent a great deal of time looking at various locations. Once we had seen Swellendam and the property that we now live on, we knew where we wanted to be. It is an area of immense beauty and an evident sense of history: a working agricultural town in rural Southern Cape that seemed to us to offer potential for life and growth. The property comprises a Cape Victorian town house and outbuildings (1860’s), proclaimed as a National Monument during the 1980’s, as well as a cottage, all set on 6 000 sq meters of very fertile ground adjacent to the Drostdy Museum in the Historic Heart of the town. It was in this setting that we saw the potential for developing our life and work as we then pictured it. Extended and enhanced working space, a showroom, a cottage for accommodating people who came to do workshops here (and also casual visitors) and extensive grounds for growing a selection of fresh produce. It was at that time (early nineties) an area that had not yet been ‘discovered’ as a refuge for exiles from the cities and nor had it yet become a ‘tourist’ town. Property was relatively affordable and it felt and seemed as if the town was on the brink of growth and development. As outsiders these were some of the main factors that seduced us. We made an offer on the property that was accepted, took out a bond and rented it out for more than a year. David and Felicity: “It was only when we were here and beginning to get going that we started to encounter some of the challenges of the move. It’s worth noting at this point that in August 1995, a full year before we moved, we embarked on a very bold step by taking an extensive and prominent stand at Decorex in Midrand. This was to give us a sense of a broader market than we had been used to and also to give us an idea as to whether we could in fact live in the country and sell our work at a trade exhibition such as this in the city. The result of Decorex ’95 was quite astounding for us. Not only did we sell an enormous amount of work during the exhibition, but also the customers and commissions that we attracted sustained our work schedule for the whole of the next year. So much so that we were still busy with work from that show when we moved, and it was that work with which we began work in Swellendam. In short the question became, could we live and work in Swellendam and continue to sell our work in Johannesburg by traveling up once or twice a year? The experience of 1995 and 1996 gave us the confidence that this was indeed possible. Together with this question were our plans of developing on the ideas of an “open working studio” in the country. We had plans to turn the old barn into a studio and showroom and carrying out extensive renovations and an extension to the old house, only to be met with the very frustrating realisation that any work planned for such a building required the approval not only from the Local Authority but also from the National Monuments Council (now called South African Heritage Resources Agency). Approval on our planned work on the studio was relatively quick, as was the building work that by May 1997 we were firing pots again and beginning to attend to some of the backlog of work for Johannesburg. We were not yet working at our full capacity as there was much else to adjust to here and it was taking us time. We had bought a second-hand 40 cu ft LPG (gas) fired kiln with which to get going and that would also give us time to consider which way to go with regard to something bigger. (We were firing a 90cu ft gas kiln when in Johannesburg – firing on town gas, and we were keen to get back to that size of kiln again). On investigation, LPG seemed to be a very expensive fuel and so we set about converting the kiln to fire with paraffin. At the end of ’97 we held our first ‘open day’ in Swellendam. (The first of three over the coming three years). Also at the end of 1997 we met Gawie and Gwen Fagan for the fist time. We had approached Gawie due to his eminence in the field of conservation architecture and we were becoming very frustrated at our inability to move ahead with regard to the work we needed to do to the house. His grasp of what we were intending, his ability to turn it into an achievable and affordable project, and his understanding of the requirements of the National Monuments Council suddenly shot the process forward. Our plans were approved, we had a commitment and budget from the same builder who worked on the studio, and we were under way! The building work on the house was completed in mid-1998 and at the end of the year we held another event, this time it was an ‘open weekend’. It was during this weekend, December 1998, that in conversation with other artists and crafts people from Swellendam and the surrounding areas, many of whom brought their work to sell in our environment, we began to develop ideas that could have some impact on local development in the area. During April 1999 we took a stand on the first Decorex Cape held at Spier Estate and again, as with Decorex Johannesburg, we did very well. August ’99 an exhibition of our pots in Westcliff Johannesburg followed by our third open weekend in Swellendam at the end of November. The discussions concerning plans for a local development programme were turning into something achievable and by early 2000 the process was beginning to move. April 2000 a shared stand at Decorex Cape at Spier and by midyear we had become involved and very active in Swellendam’s local development. During this involvement we allowed our primary focus to become marginalised by concerns beyond our immediate environment and work and it was to continue for more than four years. Our experiences through this process have given us a keen insight into the workings of this small rural town and the gruelling road that lies ahead as the country grapples with the very urgent priorities of recovery, transformation and economic development. During November 2001 an exhibition at the Dorp Street Gallery in Stellenbosch and another show in Johannesburg. 2003 and 2004: building and fine-tuning the new kiln. 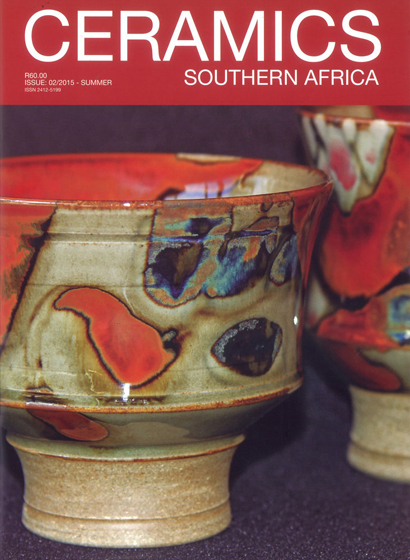 April, our Website www.pottery.co.za was published. The change from gas to oil as our fuel demonstrating the dramatic effects of fire in this process. Effects that have taken us beyond our own limitations and where the results begin to exceed our wildest dreams. The privilege of being able to develop in an environment such as this, a greater appreciation of reduction fired pots not only as far as we are concerned, but to a much wider audience. The completely breathtaking landscape and environment in which we live and work. Constant revision and assessment of our creative impulse, goals and objectives. Remaining mindful of the road travelled, those who have been and remain part of the process, the journey ahead and the necessity for constant growth and development in all areas of our joint pursuit. An appreciation of the enormous resources at our disposal in this work and environment and room to grow. The opportunity of developing on our notions of what a professional ‘working studio’ could be. We have always been interested in exploring the relationship between the food that we prepare and enjoy, the pots that we serve the food in and the company with whom we share it all. The environment in which we find ourselves and our present circumstances have allowed us to take this aspect of our life and work into a broader and very rewarding dimension. Pots for people, food and pleasure. The garden and changing seasons provide us with a continuous supply of fresh vegetables, fruit and herbs. When served and presented in our handmade pots, the colour, texture, flavour, form and function become some of the subtle ingredients in the changing tapestry of life. All of this is integral in our communication with the world around us and food, together with the pots that we make, has become central to our interaction with others. Casseroles, serving platters and dishes, bowls of all shapes and sizes, sushi dishes, mugs and jugs etc. Most of the tableware being decorative as well as functional. The crating and shipping of our work nationally and abroad has become a very exciting aspect. Recent shipments have gone off to Spain, Abu Dhabi and the UK. Much of the above has begun to gel into a rhythm of life and work where the pots emerging from the kilns have a quality that we have not experienced before – colour, texture, decoration, scale, form and volume. Tableware, washbasins, lamp bases and a wide variety of functional and decorative stoneware and porcelain. 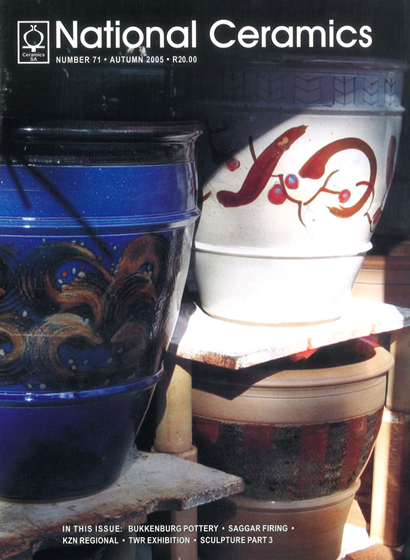 Enormous floor jars, urns platters, fountains and garden and indoor containers. Special commissions for interior and landscape designers, collectors and corporate buyers. Where an ‘open studio’ means just that – people come and go, whether to buy pots, see the work in progress, select their vegetables from the garden, spend a night or more in the cottage or any combination of reasons. Friends, family and colleagues, customers new and old as well as a wide range of travelling people from across the country and abroad. We are constantly being approached for workshops, instruction and training, and the interaction with those who come here for a period of work is proving to be very rewarding. As we begin the New Year, and after having been making pots full time since 1973, we have never been more productive. David and Felicity: “The new kiln that we’ve built is a re-build out of an existing frame. During 1998 we acquired a disused 100 cu ft electric rolling hood kiln. It was an old kiln made by Kiln Contracts in Cape Town. The original comprised two bases and a hood that rolled over each one alternately, meaning that while one load was firing, the next could be stacked etc. We immediately saw the potential for a complete conversion into an oil-fired rolling hood kiln with just one base. Our interest was primarily in the rolling system and the frame. To construct a kiln with a fixed base at a convenient height onto which our huge pots could be loaded relatively easily from their trolleys, with a fibre-lined hood rolling over the stack up to and against a fixed wall which would include the flue and chimney. The firing system would comprise two oil burners firing lengthwise into the kiln, through very substantial burner blocks, one on each side of the chimney. We discussed these ideas with a friend of ours here who is a retired farmer and technically very skilled. He offered his advice and then introduced us to a young steel worker who he suggested could work on the project. The hood is lined with high temperature ceramic fibre modules and at this early stage in its life; we are so encouraged by the way that it’s working. For a glaze firing to cone 12, we are using about 140 liters of paraffin – this in a kiln of about 100 cu ft! David and Felicity: “Our focus has always been high-temperature; reduction fired stoneware and porcelain, and the clay bodies and glaze components that we use reflect this. The stoneware clay is based on Western Province Ball Clay, blended with small amounts of Feldspar and Silica, a little red clay for colour and a large percentage of grog for strength and “tooth”. The grog is a critical factor in view of the enormous size of a lot of our work. The porcelain body is based on Kaolin G1 with additions of Feldspar, Silica and Bentonite. Although we keep experimenting with other clay bodies, and often introduce them into our work cycle, the above two clays have been constant for many years. The glazes that we use are mostly high in Feldspar and are also the result of years of trial and error. David and Felicity: “Our Website was published in April 2004 and in the first nine months it received over 14 000 visits, averaging out at about 50 visits per day – with more than 58 000 images being downloaded from the site! David and Felicity: “2005 is certainly beginning to feel like another very busy year and we will be kept fully occupied in a variety of ways. The completion of orders and commissions from our Johannesburg Exhibition last November. bullet Additions to the Website this year should include a page or two devoted to the recent work of our studio assistant Flip Jacobs, as well as some pages showing Felicity’s recent paintings. Two exhibitions are planned for the second half of the year. Details will be available after July on our Website, through the association, media and also to those on our e-mail mailing list. (Anyone interested in receiving our electronic updates and info can e-mail us). These pioneers of the Studio Pottery movement of the 20th Century have so much to teach us still! After more than thirty years of making and firing high temperature pots, our sense is that there is still a great deal to learn and do. Our life and work as practicing studio potters has been varied, rich and rewarding. We’ve had the distinct privilege of being able to work at home while at the same time being able to care for James, and find ourselves through our work to be connected to such an essential and timeless tradition. Also of great value to us over the years has been the creation and sustaining of long-standing relationships both professional and personal. Many people who came initially to look at or buy pots becoming close friends of lasting quality. We still work very hard and often think of perhaps slowing down a bit – but not just yet! We remain mindful of those whose efforts during the early 1970’s brought about the beginnings of some organisation in the studio pottery environment. Much has changed since those early days. Congratulations David and Felicity on reaching this milestone in your working lives and we wish you many more years of productive and creative enterprise. Anyone wishing to visit the studio in Swellendam would be most welcome, otherwise visit their Website. Thank you for spending time on our Some Articles pages.